We canned a fresh batch of Epiphany on our new canning line yesterday which will be out in stores throughout Maine this week, and for our tasting room allocation – half will be released on WEDNESDAY and half on FRIDAY instead of Saturday because of the holiday. It’s cold out there! We appreciate you making the trek out to the industrial park for cans and growlers, and to visit our tasting room, and to make your visit more pleasant in this winter weather, we are trying a new process this week for the Epiphany can release. We will be handing out line number cards, starting at 10am. Come, get a card which will be your “place” in line. Feel free to sit in your warm car, go grab a beer at Allagash when they open at 11am, run some holiday errands, or try something tasty at a food truck once they open (Tacos del Seoul on Wednesday and The Muthah Truckah on Friday). One card per person. We want everything to be as fair as possible, so we won’t be allowing anyone to take an extra card for a friend, or similar. Having a number does not guarantee you will be able to buy Epiphany. Some people buy their whole case allocation, but a lot of people only buy a few 4-packs. It will depend on how many packs each person in front of you bought. Our tasting room doors will open at Noon, and we will be selling cans at the back of the tasting room starting with ticket number one. Cans will only be available at the back table (along with bottles to go). Growlers, bottles and samples will be available at the front bar while you wait for your number to be called. 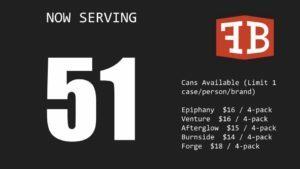 We will have a large screen that will display the current number being served so you can keep an eye on it from anywhere in the tasting room. Our tasting room greeter will be able to give you a time estimate for when your number will be called so that you can budget your time appropriately. We will have the following cans and bottles available. We hope this new process will make your visit enjoyable and without any hassle (and warm!). We welcome any feedback. Feel free to share with our tasting room staff, or email beerme@foundationbrew.com. Our hours this week on Wednesday-Friday are 12p-7p and on Saturday, special holiday hours of 12-4p. We’ll be closed on Sunday for Christmas, and open Monday for holiday-week-chillaxing from 12-7pm.